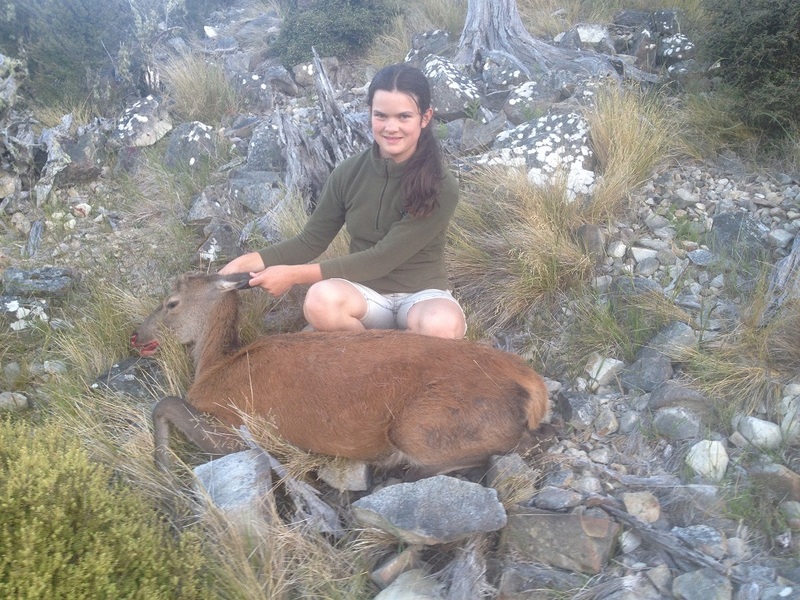 Well it has taken 3 years but my daughter Sarah finally got her first deer last night. We have been on trips where she has seen deer, but has never got her sights on one. Last night we were overlooking a nice basin when I spotted a yearling on the far side. I thought it was a bit far and felt one would come out closer, but Sarah wanted to have a go at it. She worked out what spur we would need to come down and identified a tree that would give us a good view. About 20 min later we were coming up to a rock that would give us a view. I briefly saw the deer as we got to the rock, and set up the rifle on the rock. The deer had seen us but stood there looking at us. Sarah got ready and quickly took the shot. The deer jumped at the shot and then bounded off around and down the face. We marked a dead tree it had gone past and made our way there, looking for blood as we went. We didn't notice any blood or tracks. Making our way downhill from the tree I noticed an animal track heading around the face, Sarah carried on down the hill. I had gone about 20 metres on the track when Sarah called out she had found blood. I made my way over to her, just as I got there she noticed the deer lying against a log. We dragged it out and noticed it was a small spiker. Photos and butchering done by 9:40pm, we made our way back to camp, getting there just before 11pm. sneeze, hillclima, jakewire and 46 others like this. congratulations hopefully many more to come. Awesome, well done to you both. Very cool Sarah, well done team . Been there done that with two daughters and a son so I know how proud you will be. Very cool and the perfect animal for a first for this time of year. Its all in the stalk , good stuff sounds like a real achievement . Great work. Was trying to do the same last night. How old is Sarah? She turned 13 last October.